Maybe I was a little too excited about the Freedom Run (but after winning, can you honestly blame me?) on Wednesday night. But after I took off my medal and colored bracelets to relax at home, it hit me that I missed one of the important messages from the evening. That would be release of the new Nike Free Run+, the whole reason we were running in the first place. I saw the shoes on the feet of other runners as we gathered at Fleet Feet, I just arrived too late to try a pair. And then I saw them again at our post-run party at Altitude--a special display devoted to the newest Frees and all of their pretty colors. I knew the basics of the Free technology, or at least what I remembered from the first version released nearly six years ago: how they were designed to take away many of the traditional supports of running shoes for more foot freedom, give your foot protection from the elements, and make you rely on your foot's natural motion when running. That hasn't changed and in fact, what may have been skeptical in 2004--taking out all the supports and leaving minimal cushioning so that you were practically running barefoot--is now one of the hottest rages. I know some of the skeptics from 2004 who doubted that the lack of support would be good for your running. Meanwhile, I bought into it even though I had yet to try it. Why? I liked the idea of having a shoe to wear after a long hard run that wasn't that particular running shoe but could help strengthen your foot muscles. I wore running shoes everywhere and style-wise, this didn't look like your regular running shoe. And it was recommended to alternate running with the Frees and your regular running shoes to work on that strengthening, but not going super-long while wearing the Frees. I've gotten shin splints as a result of a slight change in my go-to running shoe (the Nike Pegasus, back in the day), and through marathon training knew that it'd be OK to switch up my shoes. Yes, Nike did a good job convincing me of the Free's benefits at a 2007 media event, but the skeptics I knew said it would never fly. Look who was right. Six years and a few Free versions--3.0, 5.0, Everyday to name a few--later and we're meeting the newest Nike using the Free technology. As the latest version in the Free line of Nike running shoes, the Free Run+ updates the cushioning, support and fit from previous styles. It's more supportive than the 3.0, more flexible than the 5.0 and even more like running barefoot without exposing your feet to pavement elements. And it's the first Free shoe to be Nike+ ready so if you have the sport kit for your iPod or a Nike SportBand, you can drop the sensor into the footbed slot and track distance, pace, time and calories burned on your run. 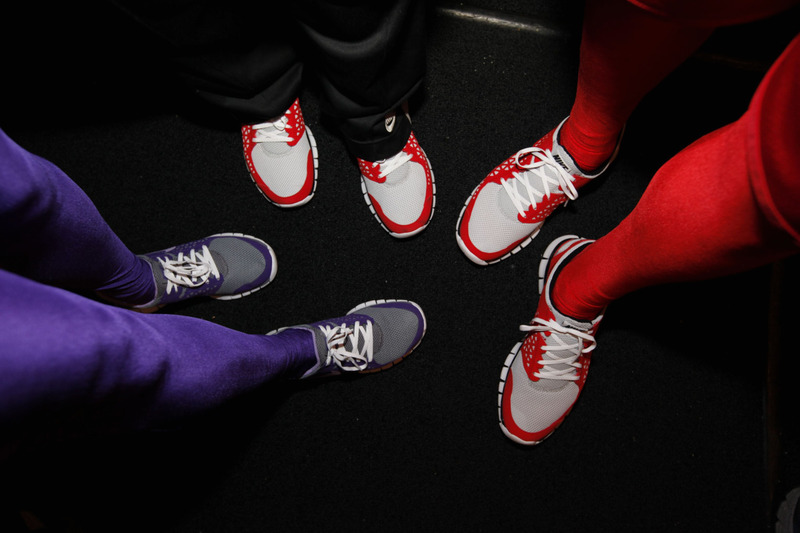 And well, these new Frees just look cool too--and you can bend them in half. 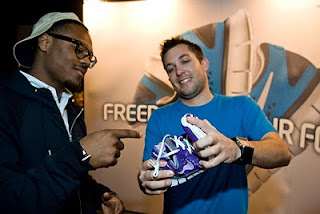 But remember that the Free Run+ still has some technology so you're not totally barefoot running. But you are bringing out the best of both worlds. The flexibility enhances your foot's natural movement, and flex grooves on the sole trigger muscle activation to strengthen your foot muscles and give you the barefoot feel. You'll still get cushioning and arch support to give you some stability in your shoe. The midsole's bootie fits your foot like a glove and make it comfy to sport the Frees with or without socks. Still not convinced? What if I said the likes of Paula Radcliffe, Kara Goucher, Dathan Ritzenhein and Meb Keflezighi use the Free technology? They do, often using the Free Run+ during recovery and cool down runs. Check out this piece for what these elite athletes had to say. Are you sold now? I've been tempted to try these, but as a big guy, always shied away. I like the idea of using them to strengthen the foot post-run. I run in both the LunarTrainer+ and LunarGlide+, which both have somewhat less cushioning, so maybe now's the time. Thanks for the review!